During the Fall, Saturdays are reserved for college football, specifically Alabama football. I have described our ritual a few times before and, even since Jake was born, not much has changed. Russell wakes up early to watch College Game Day on ESPN and I begin making a few appetizers for us to munch on throughout the day. Russell and I have never been big professional football fans but we always watch the Superbowl. Other than the commercials and the game itself, the best part of the Superbowl is the food that comes along with it. The Superbowl is the last hurrah of football season and I always indulge. 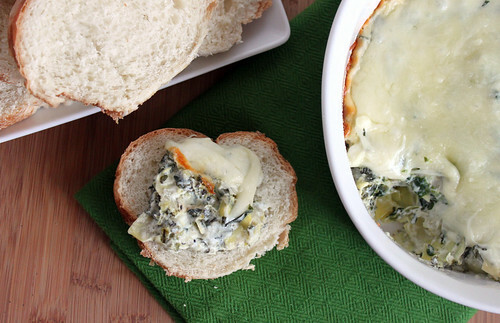 This spinach and artichoke dip is perfect for any gathering and would be great at a Superbowl party. This dip comes together quick and is creamy, cheesy and leaves you wanting more! This dip can also be mixed together ahead of time, refrigerated, and then baked when you are ready. In a medium bowl, combine cream cheese, mayonnaise, Italian cheese blend, garlic, basil, salt, and pepper. Gently stir in artichoke hearts and spinach. Spread into a lightly greased small baking dish (I used a 1 1/2 quart dish). Top with mozzarella cheese. Baked for 20-25 minutes. Serve with tortilla chips or french bread. Slightly adapted from: What’s Cookin’ Chicago?